Isaac Winslow (1709–1777) was an insatiable collector of his own likeness. Immensely prosperous, as a grown man he ordered as many as five portraits of himself and his family, each painted in turn by the leading artist in Boston at the time. The first of these was executed by Robert Feke [42.424] shortly after Winslow’s marriage, in December 1747, to Lucy Waldo of Boston. In about 1756, a large inheritance enabled them to settle in Roxbury, where they acquired the Dudley Mansion. They documented their position as the most prominent family in Roxbury with another portrait, this one by Blackburn [42.684]. Lucy Winslow died in 1768. Two years later Isaac married Jemima Debuke (1732–1790), daughter of Thomas and Jemima Reed Debuke of Boston; Winslow was twenty-three years her senior. 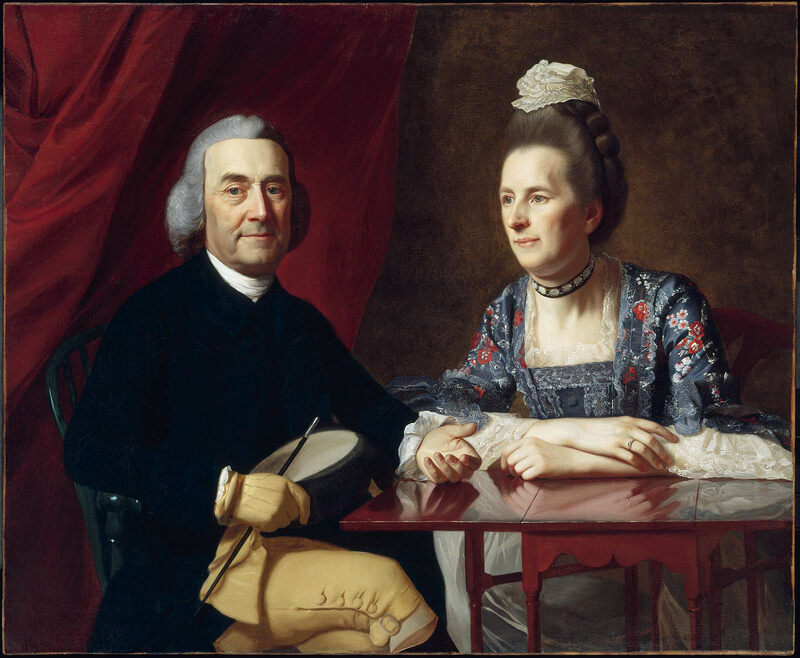 In 1773, in keeping with his custom of documenting with portraits each significant change in family status, Winslow hired Copley to depict him and his new wife in an intimate double portrait. The portrait is notable for its aura of gentility, domestic contentment, and calm; however, it commemorates a comfortable existence that was soon to end, for the months following the painting’s completion were turbulent and painful for Isaac Winslow and his family. Like so many people of his station, Winslow had seen his pleasant way of life severely threatened by the events of the early 1770s. Winslow was a Loyalist, but without firmly held convictions, and for many years he resisted political office. However, the Boston Tea Party goaded him into taking a stand, for his nephew, Joshua, and his uncle, Richard Clarke, were among the consignees of the tea; in August of 1774 Winslow accepted an appointment to the Mandamus Council, made up of thirty-seven men nominated by Governor Thomas Gage to replace the Massachusetts elected assembly. However, his councillorship soon proved to be a mistake. Winslow’s decade of philanthropy and his liberal views were quickly forgotten by his Roxbury neighbors. Public pressure forced him to resign his seat on the council and to publish an apology in the Massachusetts Gazette in September 1774. For the next seven months he lived relatively undisturbed, a peaceful interlude that unfortunately was short lived. In the wake of the events of April 19, 1775, the Winslows were forced to flee Roxbury for Boston, and in July their mansion was burned to the ground. Finally, in March of 1776, Winslow and his wife and family left with the British army for Halifax, Nova Scotia. Little is known about Jemima Debuke or what she brought to the marriage in terms of property or social status, but in the painting of the Winslows, Copley showed his two sitters in a more nearly equal relationship than was customary in earlier American husband-and-wife portraits. Although Winslow is clearly depicted as the dominant partner—he is placed beside the table while she is behind it, and the direction of their gazes and the nature of their gestures mark him as the more public member of the family—they are both seated, and their heads are on the same plane. Isaac Winslow looks toward the viewer; his open hand reaches out in a welcoming gesture. Jemima Winslow is somewhat deferential, gazing toward her husband with a fond, vaguely meditative expression. Her arms are crossed on the table. The Winslows do not touch, yet she leans toward him and her left hand and its reflection are very near his; the position of her hand echoes that of his, a harmonious parallelism of gesture that suggests intimacy. Their characterization as partners—in contrast to the hierarchy in the Blackburn portrait [42.684]—and the mood of tenderness reflect an increase in publicly expressed affection that has been documented in New England family life in the second half of the eighteenth century. The painting also foreshadows a new fashion in husband-and-wife portraiture, in which man and woman would be shown as near equals and gestures of affection would be displayed clearly. The innovations in pose and mood in the Winslow picture are matched by the innovations in Isaac Winslow’s rather unconventional attire. He is shown in riding costume: a blue frock coat; tight, butter-colored leather breeches, buckled just below the knee; and riding boots, just the top of which can be seen on his right leg. His right hand is gloved in elegant yellow kidskin and he holds a short riding crop and a soft, round hat with a brim on one side, probably a jockey cap. The custom of painting sitters in riding habit had become fashionable in England by the 1760s, but Copley himself had used such a costume only once before, in Mrs. Epes Sargent II (Catherine Osborne) (private collection). To present a subject in full riding gear—including jockey boots, seated indoors with his rather formally dressed wife at a delicate table, with a swag of drapery behind him—was a conceit that must have suited a man who already possessed two grand images of himself and who perhaps now envisioned himself as a comfortable landed gentleman. By 1773 Winslow seems to have wanted to be shown as the man he had enjoyed being for the last ten years: a lover of country life, for whom riding was one of the many outdoor pleasures. While the green Windsor chair and the somewhat old-fashioned gateleg table with which he is pictured occur in a number of Copley’s portraits of the 1770s and were no doubt studio props, here they serve Winslow as attributes of ease. Without renouncing a bit of stylishness, Winslow appears quite natural, as though he were seated not among his best things but among the familiar, worn, and comfortable accessories of his household. Mrs. Winslow wears an elegant gown of fine brocaded silk (a very expensive fabric, imported from England, whose floral pattern was actually slightly old-fashioned by the 1770s), with sleeve ruffles of broderie anglaise and a moonstone necklace at her throat. An extremely feminine lace cap floats on top of her towering hairdo, which was considered quite stylish in the 1770s. The Winslows managed to keep this portrait with them, despite extreme duress, when they fled from Boston to Halifax and then to New York (where Isaac Winslow died in 1777), and Mrs. Winslow was able to take it with her when she moved on to London. 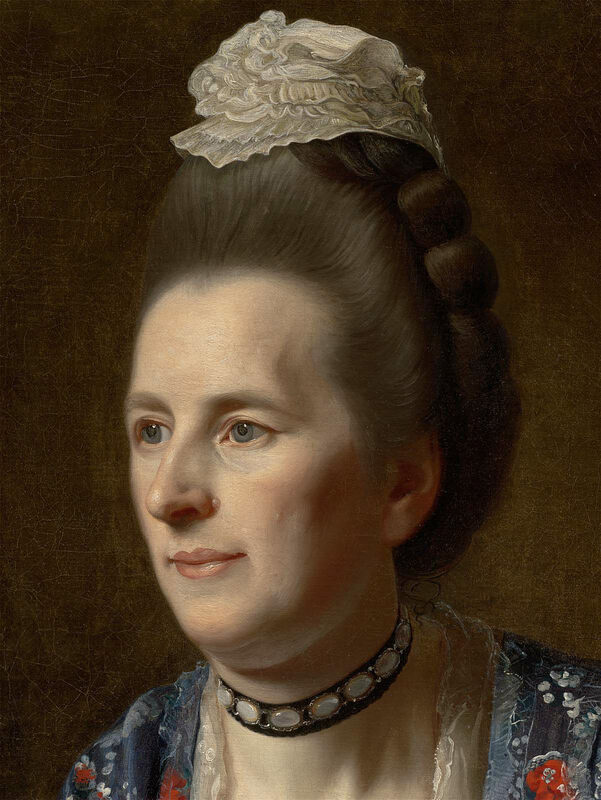 She is believed to have settled there by 1780; not long after her arrival, she appears to have hired a painter other than Copley—even though he was in residence in London by then—to restore and rework the portrait, repairing the damage it had suffered since her departure from Boston, and changing her floral silk to a simple gray-green dress and her cap of lace, gauze, and ribbon to a more restrained braid. These alterations were more in keeping with emerging neoclassical taste and, especially to Londoners’ eyes, were more in harmony with Winslow’s rather soberly colored attire. This later dress was removed, and the original costume restored, in 1975. 1. Margaretta M. Lovell, “Reading Eighteenth-Century American Family Portraits: Social Images and Self-Images,” Winterthur Portfolio 22 (Winter 1987), 247–51. This text was adapted from Carol Troyen’s entry in John Singleton Copley in America, by Carrie Rebora et al., exh. cat. (New York: Metropolitan Museum of Art in association with Harry N. Abrams, 1995). Center right: [ ]pin[ ]/73.